Keep a close eye on any children in or near the water, and don’t ever leave them unsupervised. It is a good idea to have a designated pool watcher that is an adult that watches and children in the swimming pool. This will be the only thing they should do at this time. They should not read, text or play games on their mobile, but should have it close at all times to call for help if necessary. If a child is ever missing, thoroughly check the pool first. Although a lifeguard may be present, parents or guardians should slso take on the task of being a Pool Watcher. If the lifeguard chair is empty, other lifeguards can not see the entire pool area especially when they are seated in low chairs, as their line of sight be blocked by others in the pool. Swimming is more than just a pastime, it is a skill that could save a life. Children should participate in learning to swim with many opportunities available from Cleveland Area YMCA’s, USA Swimming, Cleveland Parks and Rec Department, and many other free or low cost lessons. 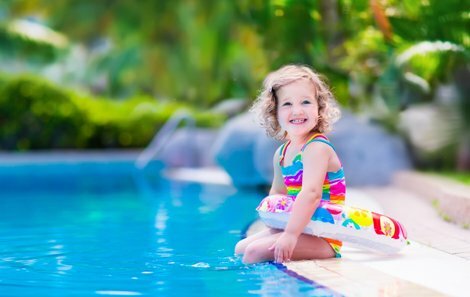 Don’t play or swim next to drains or jet inlets in spas and pools, and never use a pool or spa with loose, broken or missing drain covers. Hair, arms. legs, jewelry or swim suits may get stuck in a drain or suction inlet. Before entering a spa or hot tub, locate the emergency shutoff in case you need to shut the pump off. Cleveland Public pools and spas must always have drain covers or grates meeting applicable safety standards in order to prevent life threatening accidents and incidents. Suction from pool and spa drains can be strong enough to trap even adult swimmers. Fences, barriers, alarms and pool or spa covers when used appropriately and kept in good working order, can save lives. Fences should be four feet or higher around pools and spas and should not allow for children or pets to go around or climb over. A self-closing and self-latching gate should also be used to access the pool area and an alarm may be installed to alert those in the house that the pool area has been accessed. Learning CPR can help save a life as pool patrons are usually first to encounter pool related incidents. Once you are certified in CPR, you should remember to keep the certification current. Many classes can be found at Cleveland Area hospitals, rec centers, or through the American Red Cross.